Want to get closer to your primal beginnings? Have kids. During nine-months of pregnancy, you will learn about all the evolutionarily-influenced mechanics of giving birth, from the fetal acrobatics involved in maneuvering an enormous head required to house our big brains through a birth canal constrained in size so that human females can walk upright. Next time you look at a newborn baby, take a moment to appreciate these many echoes to our primitive origins. One of my favorite cases of embryological evidence for evolution is the furry human fetus. We are famously known as “naked apes” because, unlike other primates, we don’t have a thick coat of hair. But in fact for one brief period we do—as embryos. 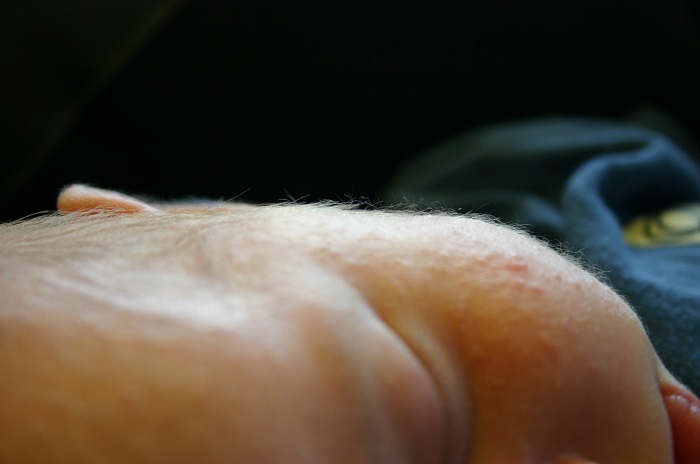 Around sixth months after conception, we become completely covered with a fine, downy coat of hair called lanugo. Lanugo is usually shed about a month before birth, when it’s replaced by the more sparsely distributed hair with which we’re born. 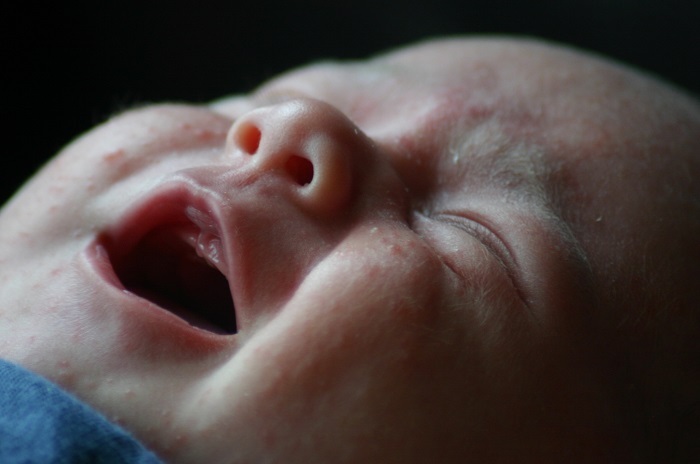 (Premature infants, however, are sometimes born with lanugo, which soon falls off.) Now, there’s no need for a human embryo to have a transitory coat of hair. After all, it’s a cozy 37 degrees C in the womb. Lanugo can be explained only as a remnant of our primate ancestry: fetal monkeys also develop a coat of hair at about the same stage of development. Their hair, however, doesn’t fall out, but hangs on to become the adult coat. And, like humans, fetal whales also have lanugo, a remnant of when their ancestors lived on land. 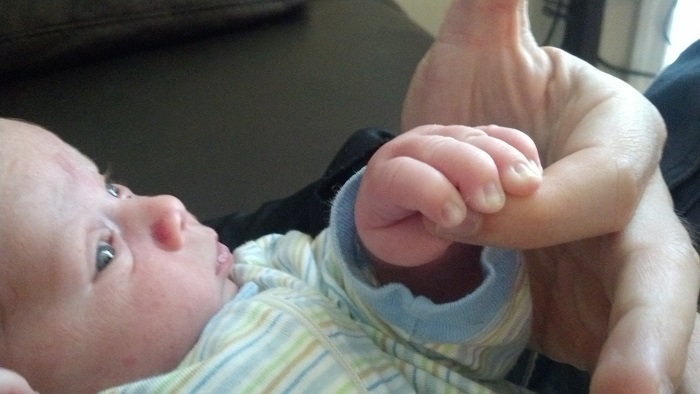 Give your finger to a newborn, and you will find they have a remarkably strong grip. You can see the fingers in this photo going white as they try to hold on. This instinct is a holdover from when our ancestors were much more hairy, and an iron grip on that hair reduced the chances of being dropped. A similar instinct occurs in the feet, which curl when tickled, from when our ancestors had feet that could grasp. 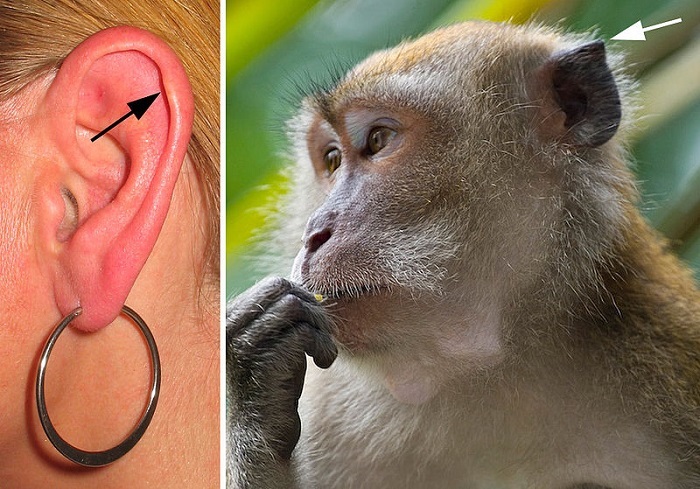 Our ancient ancestors had pointy ears, and we retain just a barely perceptible point in our own ears in adulthood. I’ve found newborn ears fascinating in the way they are still unfolding–so simian in appearance before growth rounds them out. 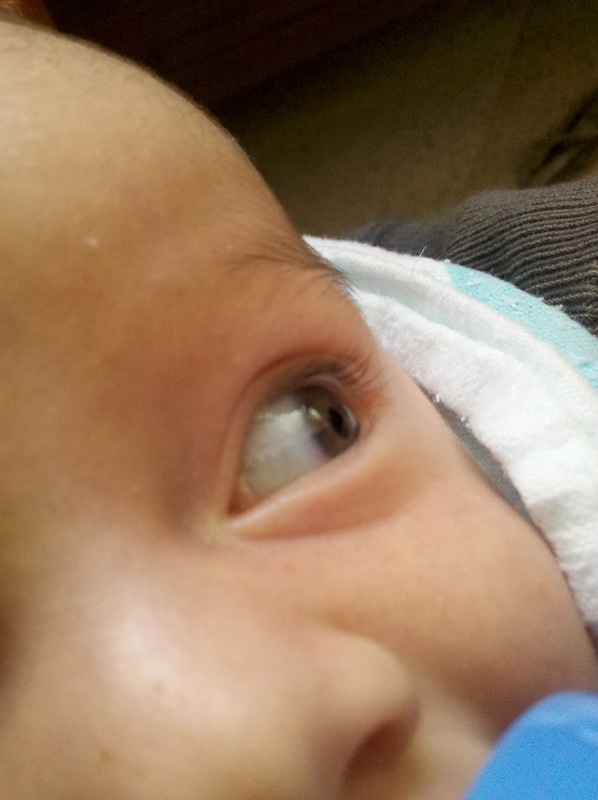 Infant eyes are very large in proportion to their heads. This makes it easier at times to appreciate this little fleshy spot in the corner of our eyes (and all the eye-boogers they produce). This is the remnant of our ancestors’ nictitating membrane, or “third eyelid” found in reptiles. Bjørn Østman’s Pet Theory about the Human Nose and Breastfeeding really groked with me, having read it right after the birth of our second son. If humans had noses like chimpanzees, flat nostrils on our faces, we would suffocate during infancy–smothered by our mothers’ pronounced breasts, but the human nose can be pressed flat against the flesh and still allow air to pass. My wife, Vicky learned about this at a breast-feeding session she attended while we were at the hospital. Infants have fontanelle, their skulls are made of bony portions connected by flexible membranes. 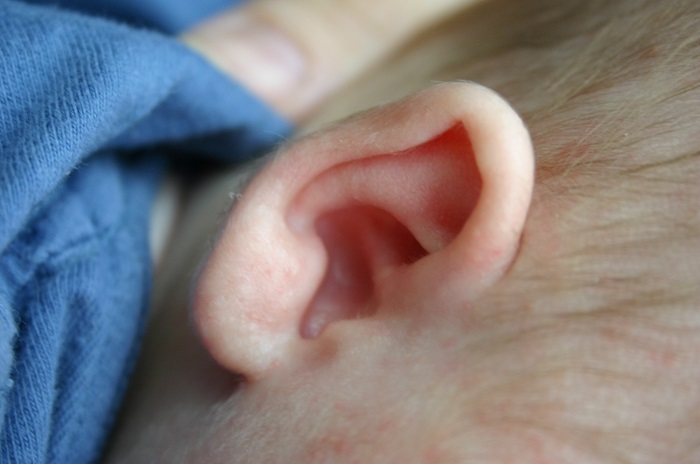 This is most noticeable in the soft-spot on the top of a baby’s head. These membranes allow for the brain to grow and expand faster than bone can grow to accommodate it. The mind of an infant growing into an adult is a peek at how our ancestors thought. Thank you for writing this fascinating article!